RA Physical Therapy Blog: Is your spine ready for the iGeneration? Is your spine ready for the iGeneration? iPrevent iPain from iPads and iPhones. 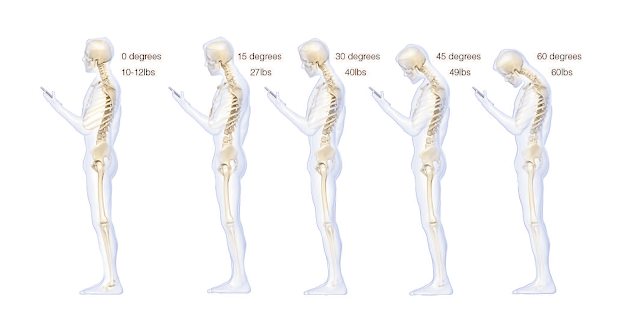 With the recent increased use of personal electronic devices (PEDs) such as Smartphones and tablets, there has been an increased incidence of upper shoulder and neck syndromes. One of the major contributing factors is the head position maintained while using theses devices. The average head weighs 6 kg or 13.2 pounds, and it exerts 10-12 pounds of weight on the neck in neutral position or 0 degrees. A 15 degree tilt in the neck increases the forces on the neck to 27 pounds, and 40 pounds at 30 degrees. On average people spend two to four hours a day with their heads tilted over their PEDs, reading and texting. This tilting causes loss of the normal curve of the cervical spine, which leads to increased stress and potentially early degeneration, muscle pain, headaches and surgeries. While it is impossible to avoid technologies that cause these issues, individuals should seek physical therapists who can help with postural alignment and muscle re-education to prevent future neck syndromes. Yes that's true! And in the worst case you would also be going under Cervical Laminoplasty. So be careful of your cervical spine. Thanks for sharing. Keep exploring.